Use PayPal Automatic Payments to pay and manage all your recurring bills, monthly subscriptions and even instalment plans, all in one place. Have an account? Manage your payments now. Instead of having to manage multiple recurring bills with different bank accounts, you can now do it easily all in one place. When you pay your subscription services with PayPal, you can use your preferred credit or debit cards and keep earning reward points. Manage your recurring payments with PayPal Automatic Payments and enjoy peace of mind knowing you're protected with Buyer Protection. 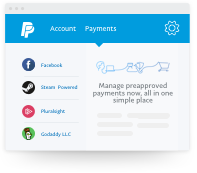 To start, go to the merchant's site and choose PayPal as your preferred payment method after logging in to your account. 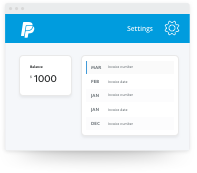 After that, follow the steps below to manage your subscriptions with PayPal. Log in to your account, click on Settings at the top right-hand corner. 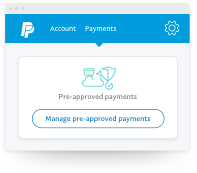 Select Payments then Manage pre-approved payments to see subscriptions. Pick any of your subscriptions to see more details and make any changes required.